On Tuesday October 9, 2018 at 4 p.m., Habitat and its newest partner family will break ground at 39 Prospect St. This new build is the future home for a Veteran family. He is an Army Vet and she is a Marine Vet, the Turcotte’s have two young children. The family will help build their home alongside the many volunteers. The Greater Dover Chamber of Commerce will be on hand along with Habitat and the Turcottes as we place the first shovel in the ground at the site where the home will be built. Head out and join in, the event is open to the public. Marcie Bergan, Executive Director of SENH4H, said “the community has already come together and there are several Veteran Build and corporate build days scheduled to help us raise the roof. We cannot do what we do without the support we receive from our volunteers, corporate team builds, donors and individuals who support our mission of affordable housing”. Veterans Build is Habitat for Humanity’s national initiative to provide housing solutions and volunteer opportunities to U.S. veterans, military service members and their families. The program focuses on building affordable housing, engaging military members through volunteer opportunities, home ownership opportunities and honoring our local veterans. The mission of Southeast New Hampshire Habitat for Humanity is to eliminate poverty housing in Southeast New Hampshire. We are a nonprofit 501(c)(3) organization that works to strengthen families and communities through affordable homeownership opportunities. Southeast NH Habitat for Humanity works in partnership with corporations, like-minded community groups, faith-based organizations, universities and individual volunteers and donors to develop communities by building and renovating simple, decent, affordable homes with hard-working people who are in need. We partner with families whose income is above public housing guidelines and who are unable to qualify for conventional mortgages. We offer a hand up – not a hand out. 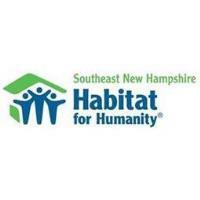 To volunteer, donate or learn more about Southeast NH Habitat for Humanity call 603-433-9555 or visit their website at www.senhhabitat.org.